GROW IT. KNOW IT. | "Hey, hey! Ho, ho! Keep your hands off-let it GROW!" Middle school students have strong opinions. These opinions have much to do with their habits, lifestyle, home environment and their exposure to society (including social media). 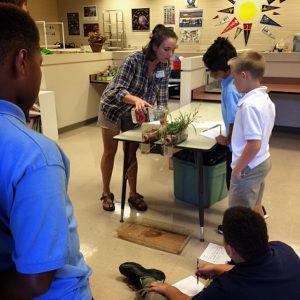 AmeriCorps VISTA Julia Calder has had multiple opportunities this fall to hear more from students and their beliefs surrounding environmental stewardship, human impact and the future of society’s relationship with nature. 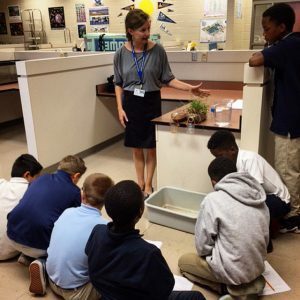 With the guidance and expertise of Seri Beall, Clarke Middle School’s International Baccalaureate Program Specialist, Julia incorporated sustainability topics and IB standards that were relevant to current classroom units in two different areas of study and two grade levels. Julia and Seri were welcomed into an 8th grade Social Studies class as well as the 6th grade Agricultural Sciences classroom for multiple days. Julia and Seri wanted to teach and show students the effects of development on our soils and the environment as a whole. Relating it to Georgia geography, history and current events was imperative for the 8th grade classes and students enjoyed the experiment set-up by Julia that helped them to better understand erosion, run-off, loss of habitat for animals, CO2 emissions and more. The 6th grade students enjoyed conversing over their unique ideas on how to move forward in development that is more environmentally-friendly. The experiment was also a hit with the younger groups (“that water is brown from the clay!”). Some students believed that the building of shopping centers should not cease or change because it creates jobs and new places to visit and shop. Other students saw this development as harmful to our earth and unnecessary. Julia and Seri gave the students an opportunity to brainstorm innovative and environmentally-friendly building practices. Ideas that were shared included more parking garages versus parking lots to save space, the building of businesses in trees instead of cutting them down and placing parks or more green space in shopping centers for families to congregate at. Julia’s favorite comment, however, came from a 6th grade female student who was ultra curious about Julia’s job and why she chose it. The student seemed fascinated by the idea of protesting peacefully to save a tree or an undeveloped area of land and even drew a detailed image of someone participating in the activity. The student asked about songs, rhymes and chants that protestors would use and in a blink of an eye she was singing a jingle that came to her on the spot. She proudly sang out loud: “Hey, hey! Ho, ho! Keep your hands off let it grow!”. This interaction has helped Julia to find more purpose in her position as VISTA and has given her more hope for the future generations who will apply their experiences and morals to how they interact with one another and with the environment for many years to come. Julia and Seri hope to be invited into another classroom for lesson teaching around sustainability and thinking with a global perspective. The impact has shown through interactions Julia has with students in the hallways of school (“Hey, when are you going to come back and teach us again?”) and one can only hope that these classroom activities will influence their choices on consuming and start a conversation at home.